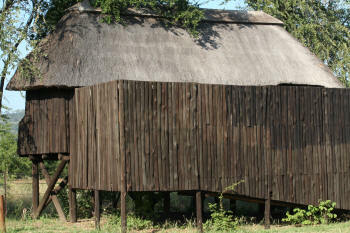 The Punda Maria Rest Camp has a beautiful well maintained bird/game hide situated within the camp fences. This bird come game hide has lights that illuminate a small waterhole in front of it as well as parts of the surrounding bushveld. 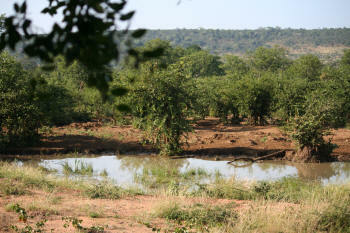 The floodlit waterhole and hide attracts all sorts of wildlife during the day light and night time hours. The bird hide is close to the ablution block in the Punda Maria camp and caravan site. The Punda Maria camp hide offers a variety of special sightings, depending on what your interests are. The hide is very clean and well maintained and a gentle breeze often flows through the hide which can give you a break from the scorching Kruger Park sun. The 2 lights situated below the hide offer great night time game and bird watching and is an amazing experience. The lights are on the whole night from sunset to sunrise and the animals are not effected by it at all. What Can Be Seen From The Punda Maria Camp Hide? Lots of wildlife occurs within view from the hide, lizards, insects and bats are quite common. Listed below are birds and mammals that can be seen regularly from the hide, day or night.